Nutritional therapist and healthy eating expert Amelia Freer has helped her many celebrity clients, including Sam Smith and James Corden, to dispatch fad diets to the distant past whilst guiding them to a rejuvenated future. Now she can do the same for you. Amelia Freer brings a fresh and unique voice to the field of holistic health. In this, her first book, she explains her 10 steps and provides over 25 enticing recipes to get you started on your path to optimum wellness. 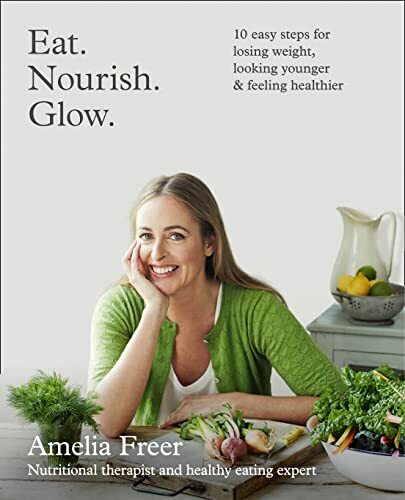 Amelia guides you gently through her 10 steps: how to detox your store cupboards and restock with alternatives, how to understand the differences between good and bad fats, the dangers of hidden sugar in the food we eat and how to dump the wheat (one of the demons!) from your diet. Her ideas are all backed up by the latest findings in the field of nutrition and neuroscience. Amelia includes a mouth watering selection of recipes, from delightful breakfast alternatives, such as Almond, Apricot and Rose Yogurt, light lunch ideas such as Crunchy Crab Salad and delicious mains such as Monkfish with a Broccoli and Ginger Mash. Wow your friends with the fiendish yet healthy sweet alternatives such as the Salted Caramels. There’s something for everyone in this book and with Amelia guiding you on the path to better health, losing weight and looking great has never been easier.